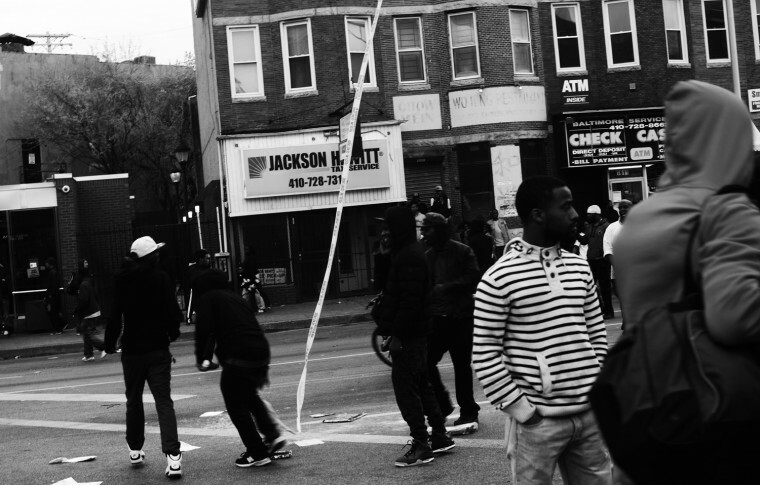 I watched the Freddie Gray protests unfold with two different eyes. 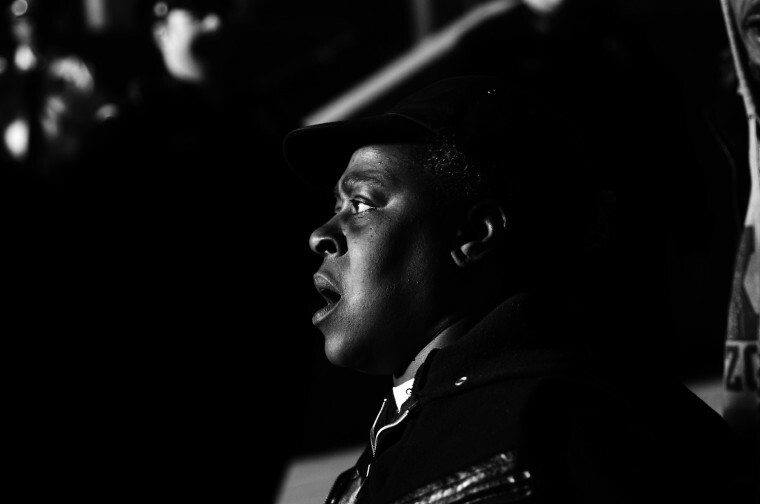 One eye kept a watch over editorial photos for the Baltimore City Paper and the other looked out for shots that would evoke the raw energy of the events best rendered in black and white. Much like Magnum photographer Gilles Peress’ seminal work Telex Iran, my black and white photos are more about mood, anger, time, and rage stripped of color. I do not shoot zoom, which is to say that all my lenses are “prime” or fixed so I have to get close to the action to get these photos. Sometimes I get too close. Many aren’t “sharp” or “crisp” and that’s the intention. To make the viewer feel them as if they were right there, in the battle zone, not as if they’re staring at perfect photos on a newspaper page. 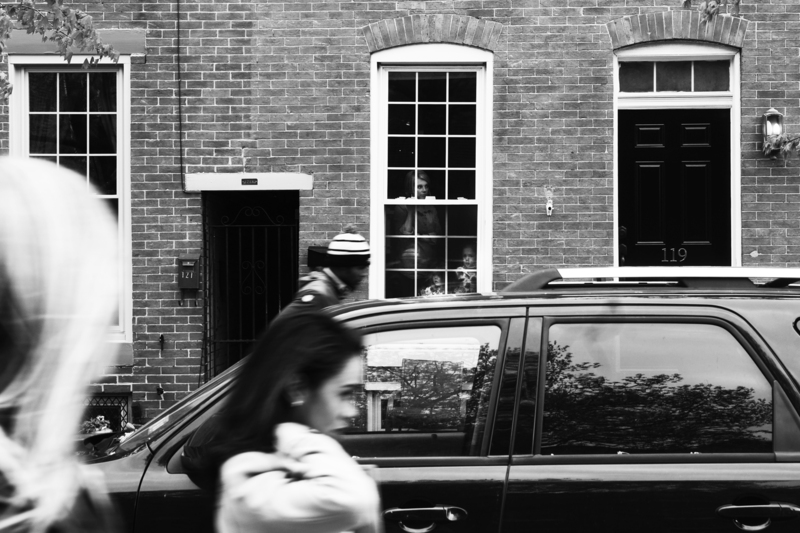 I’m posting the photos daily on a Tumblr called Gray in Black & White. J.M. 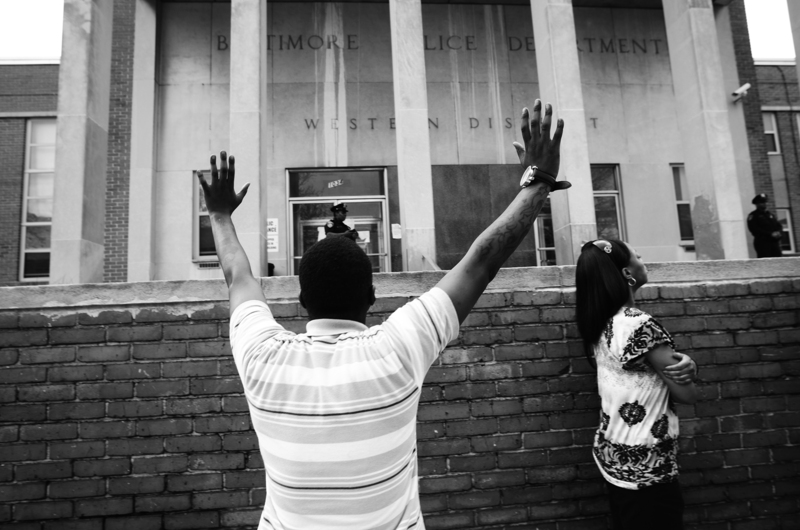 Giordano is the photo editor at Baltimore City Paper. 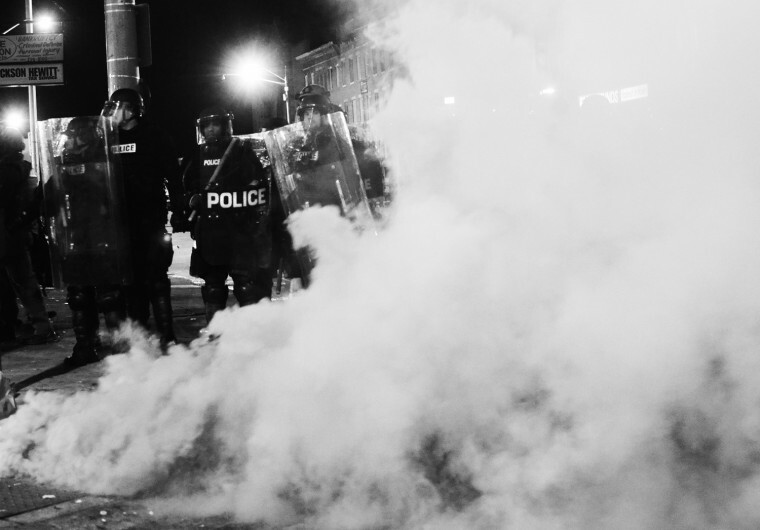 April 20: Things get heated at the first protest over the death of Freddie Gray, who died after being arrested by Baltimore City Police. 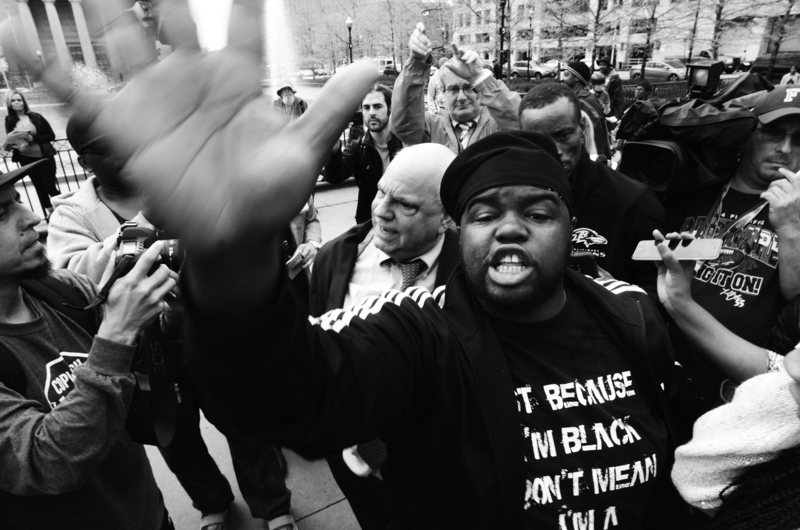 At City Hall, an older white man defends police to the African American protesters. 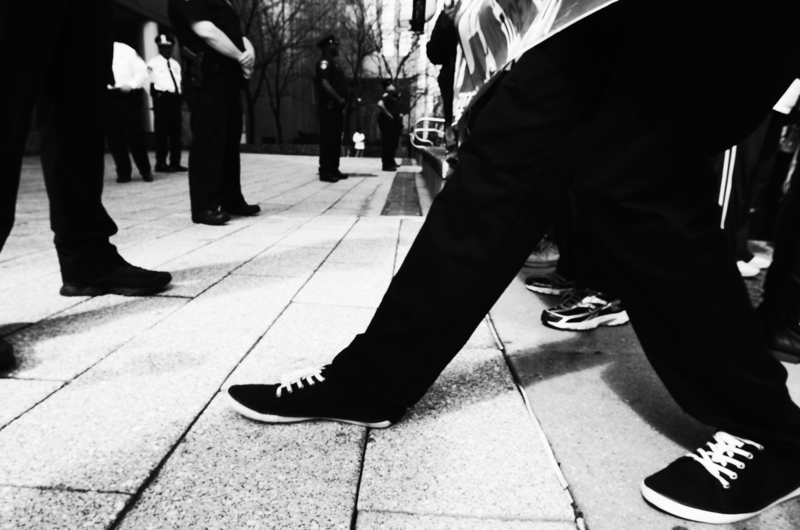 April 20: At the first day of Freddie Gray protests, a protester taunts police by putting his foot on police property after being warned not to step forward. See more photos from the day here. April 20: For the first time protesters show up at BCPD headquarters to protest the death of Freddie Gray, who had died the day before. See more photos from the day here. 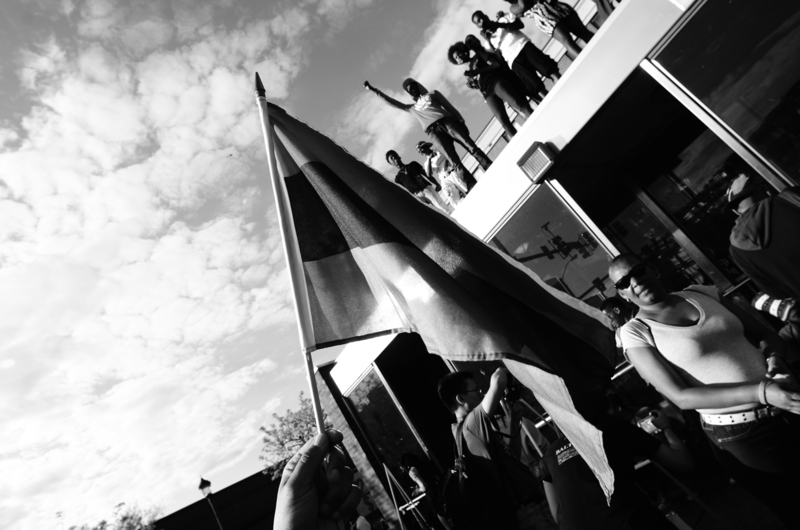 April 20: The first protesters show up at the Western District. See more photos from the day here. April 20: Western District brass enter the crowd gathered at the precinct. Though peaceful, they are mobbed by protesters looking for answers. BCPD tweet: Our promise to the community is that our investigation will be completed by a week from this Friday. See more photos from the day here. 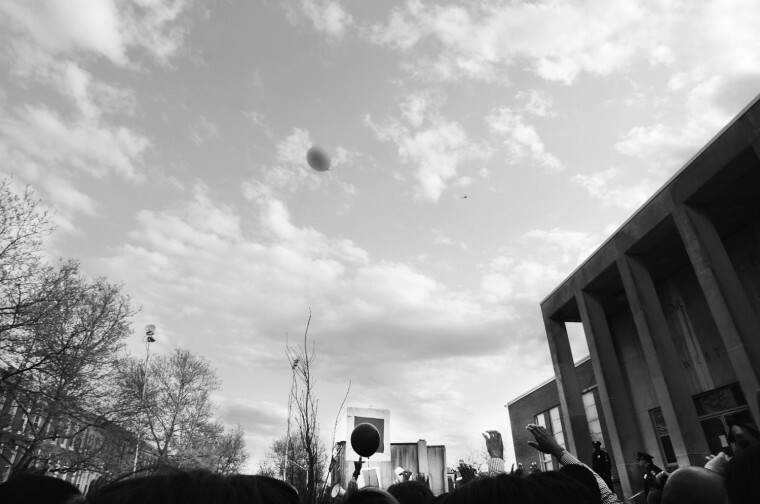 April 21: Hundreds gather at the Western District precinct for a peaceful vigil in memory of Freddie Gray. See more photos from the day here. April 21: Hundreds gather at the Western District precinct for a peaceful vigil and march in memory of Freddie Gray. BCPD tweet: #PCBatts meets with residents in Gilmor Homes after yesterday’s commitment to maintain a strong… See more photos from the day here. 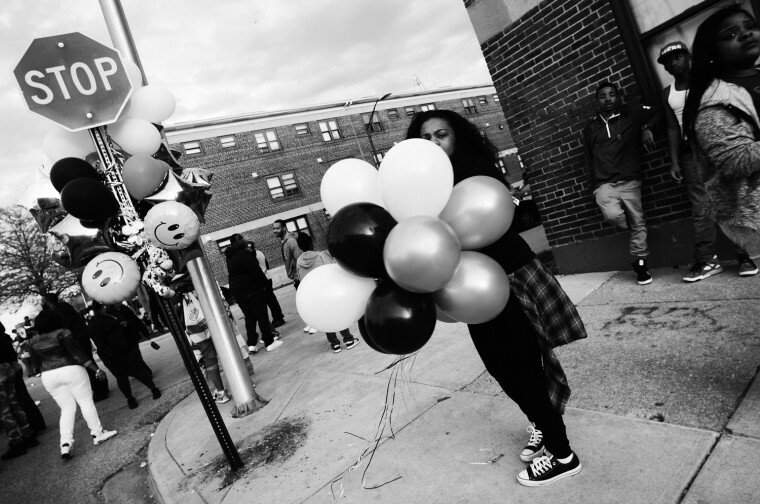 April 21: Balloons are brought to the vigil site in memory of Freddie Gray. See more photos from the day here. 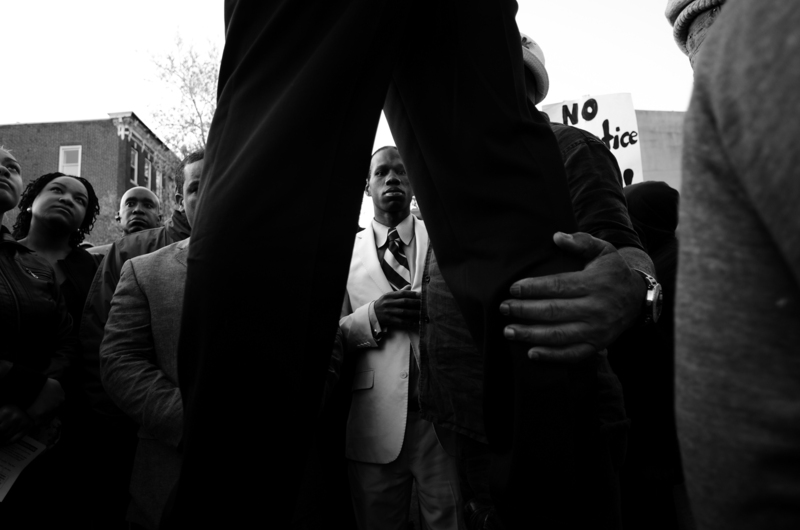 April 21: Hundreds gather at the Western District precinct for a peaceful vigil and march in memory of Freddie Gray. See mre photos from the day here. 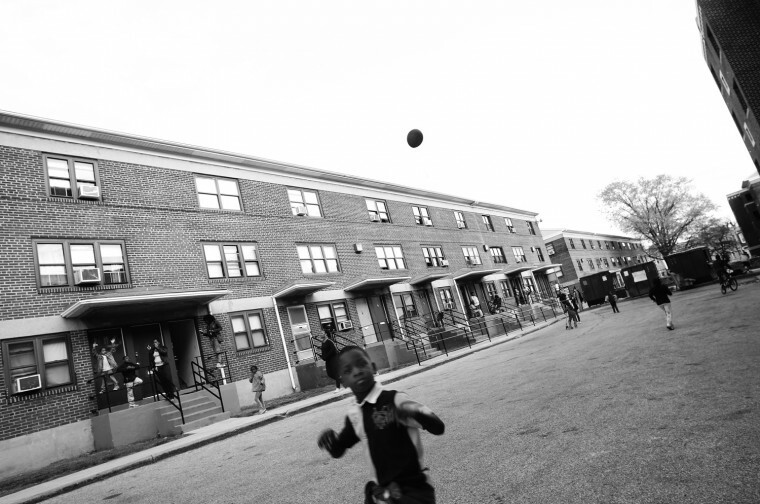 April 21: A boy plays at the Freddie Gray vigil site. See more photos from the day here. 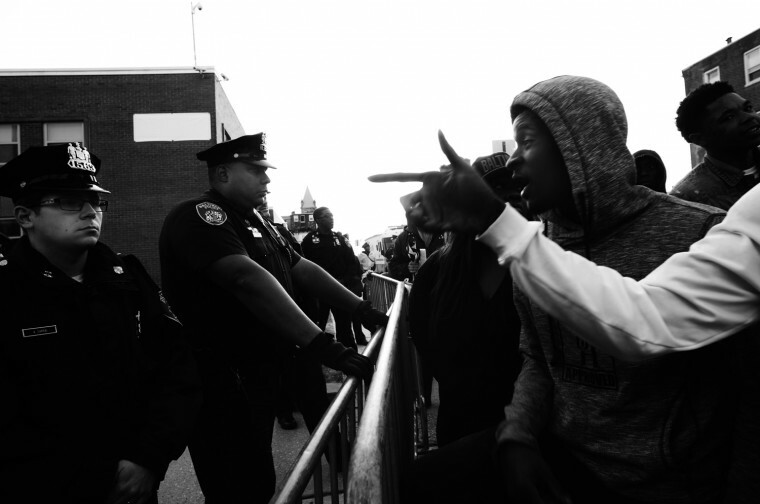 April 22: For the first time, protesters confront police at the Western District precinct. Barricades are set up for the first time. BCPD tweet: We continue to support the right of people to protest. To allow emergency vehicles to enter & exit the District, barriers are in place. See more photos from the day here. 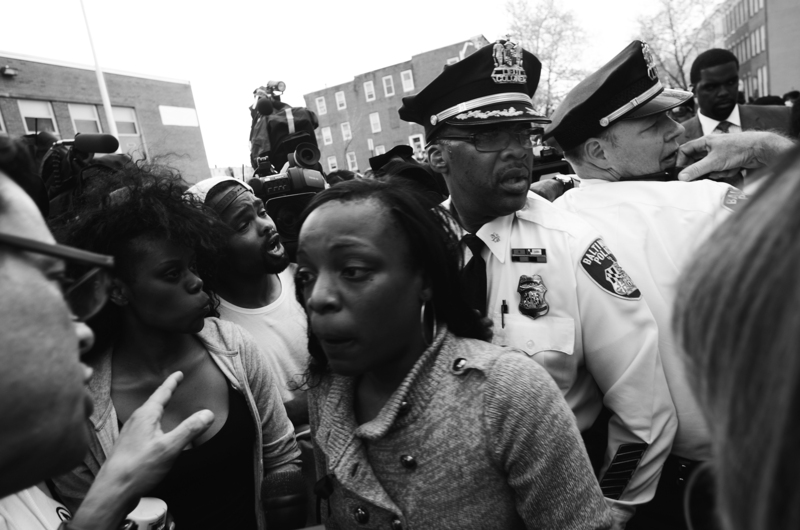 April 22: For the first time, protesters confront police at the Western District precinct. Barricades are set up for the first time. See more photos from the day here. 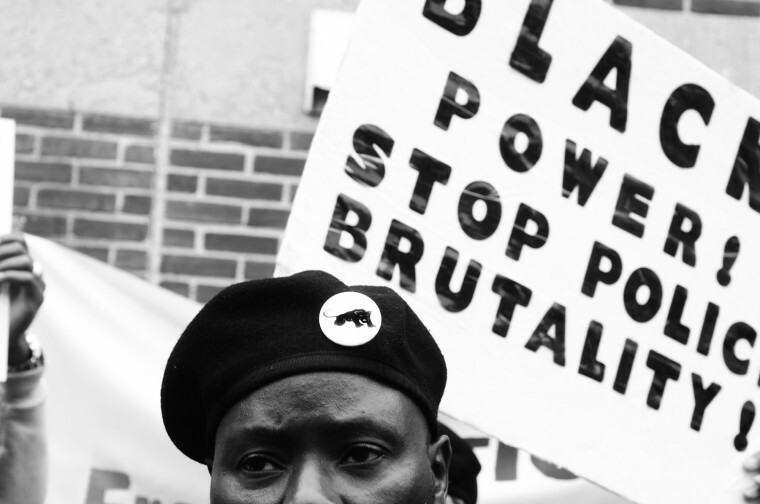 April 22: The crowd at the Western District listens to Black Lawyers for Justice President Malik Zulu Shabazz, who showed up with members of the Black Panther Party and the Nation of Islam. See more photos from the day here. 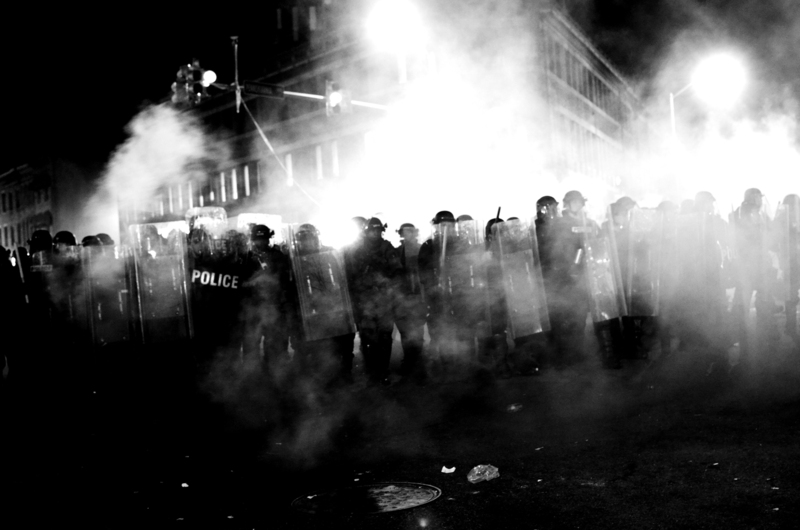 April 23: Protests at the Western District continue into the night. See more photos from the day here. April 23: Protests at the Western District continue after a march downtown. See more photos from the day here. April 24: The protesters march through Federal Hill BCPD tweet: We know Mr Freddie Gray was not wearing a seatbelt in the prisoner transport van. Our investigation is still ongoing. See more photos from the day here. 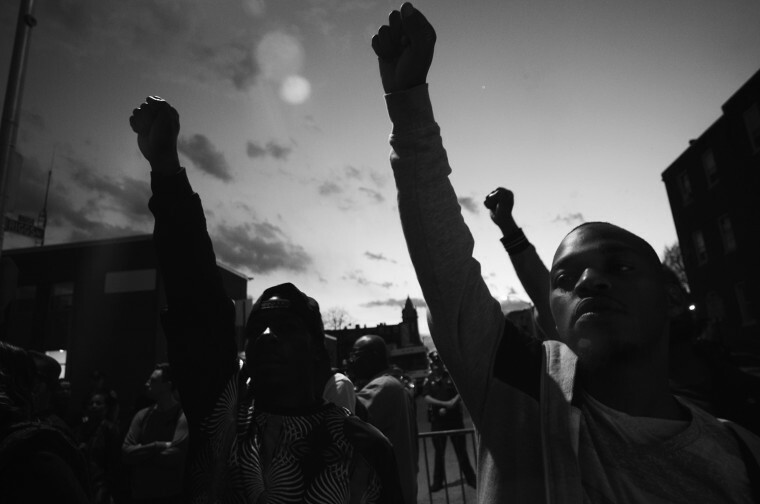 April 25: A massive march takes place from the Freddie Gray vigil site to downtown. See more photos from the day here. 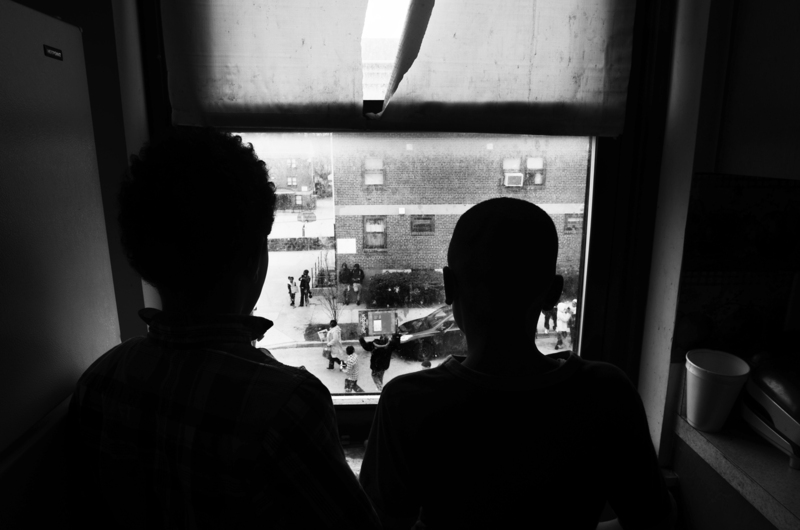 April 25: Two boys watch from their window at Glimor Homes as a massive march is led from the Freddie Gray vigil site to downtown. See more photos from the day here. 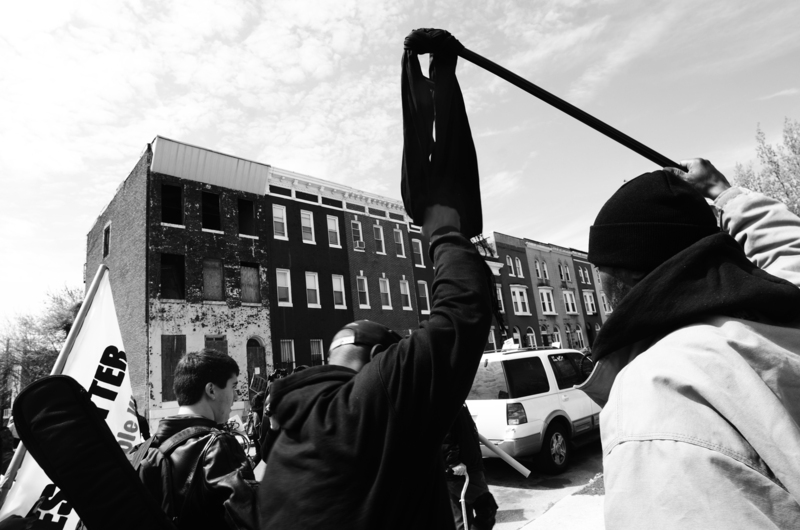 April 25: A man holds up a “mourning cloth” for Freddie Gray during the march downtown. BCPD tweet: We are listening to the concerns of the community while protecting their constitutional rights to protest and be heard. 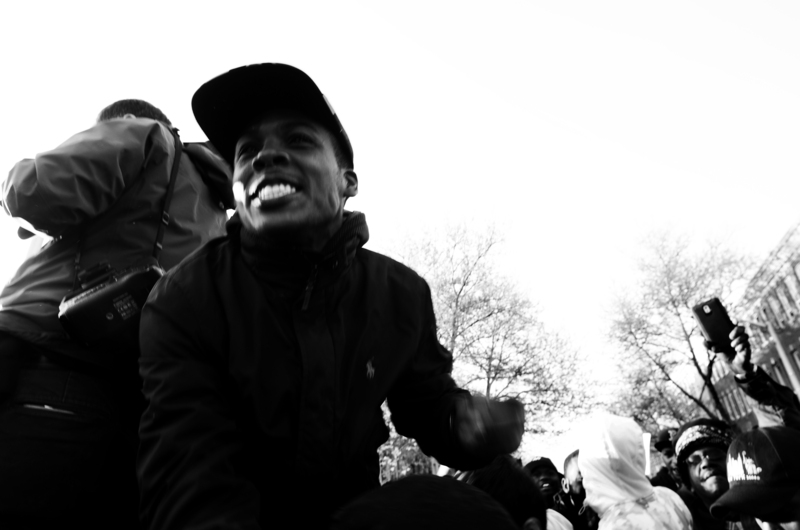 #WeHearYou See more photos from the day here. 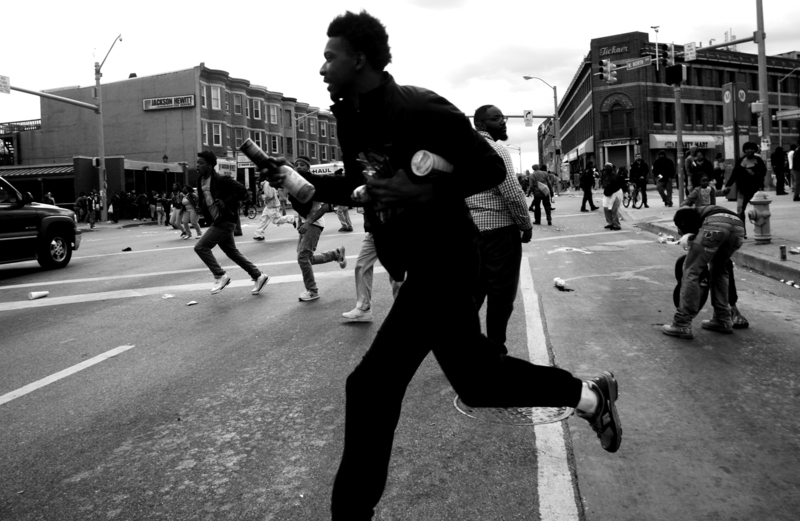 April 25: Fights break out between police and protesters near Camden Yards. 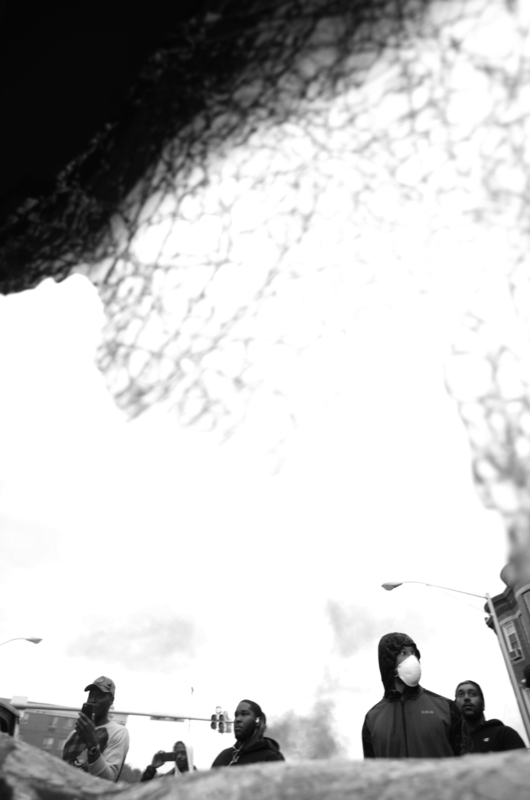 A police officer loses his helmet as a brick flies overhead. BCPD tweet: We are doing our best to facilitate everyone’s 1st amendment rights to be heard. Protesters are now breaking windows and throwing items at us. See more photos from the day here. 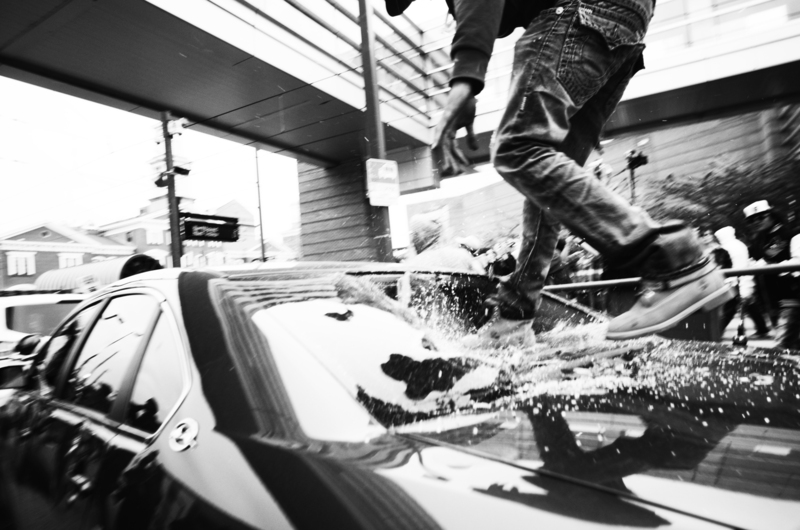 April 25: After a peaceful protest, protesters destroy police cars parked near Camden Yards. See more photos from the day here. 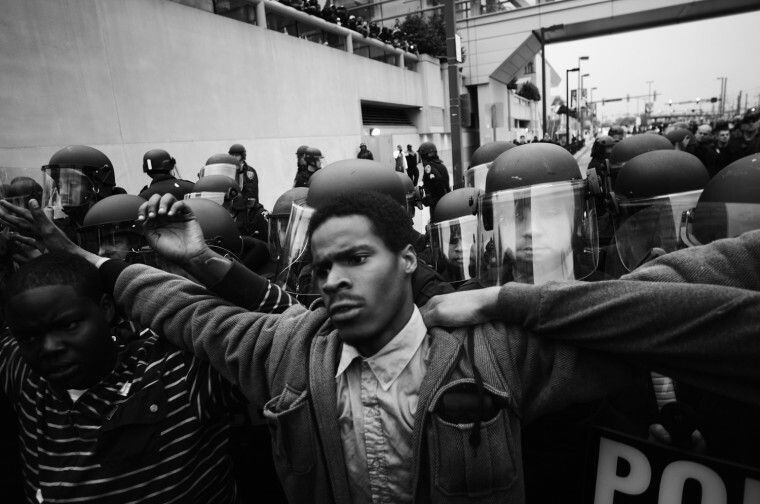 April 25: Peaceful protesters put themselves between police and the more violent protesters. See photos from the day here. 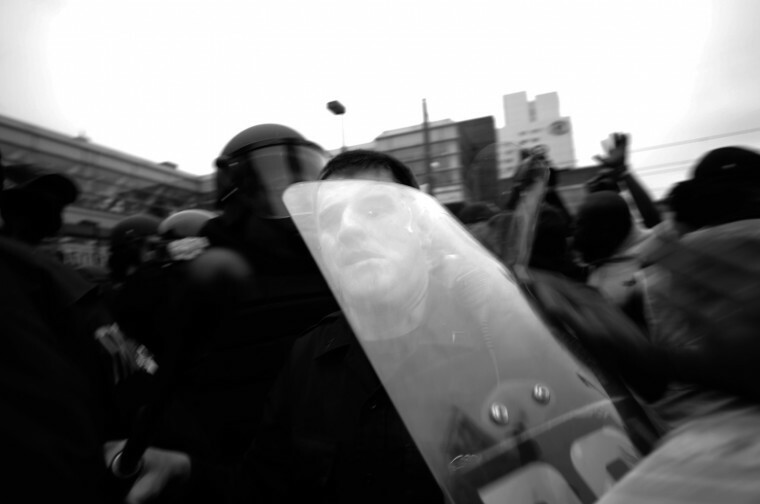 April 26: After a night of looting, the focus of the protests switched back to the Western District Precinct, where protesters taunted police in the early morning hours. See more photos from the day here. 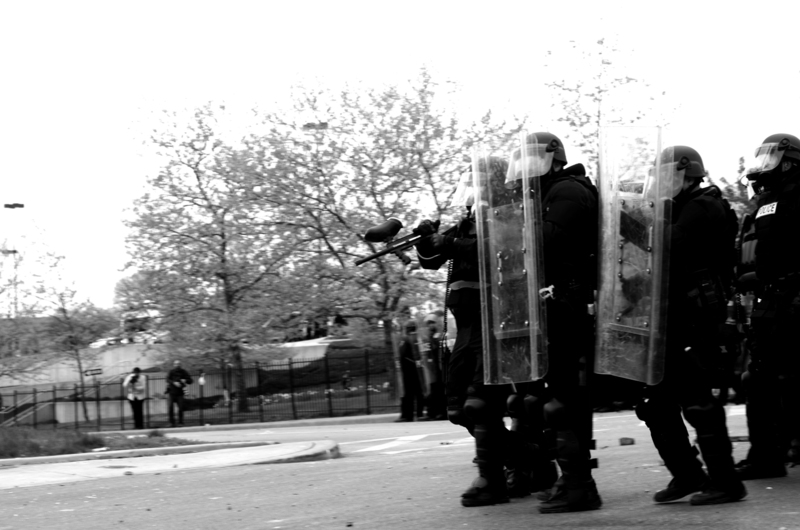 April 26: After being pelted with bricks, stones and water bottles, police charge protesters. During the charge, City Paper photographer J.M. Giordano was beaten by police and Reuters stringer Sait Serkan Gurbuz was arrested, charged with disorderly conduct, and later released. 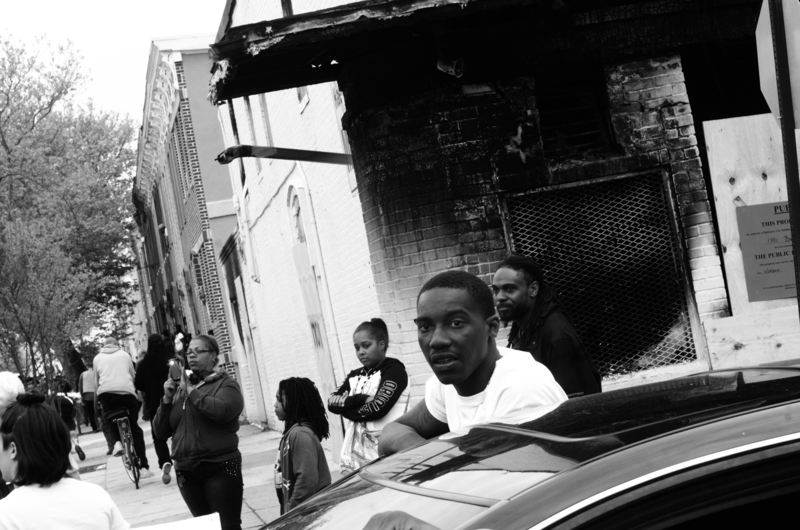 BCPD tweets on April 25 (there are no tweets about the early morning action at the precinct): We continue to have a few individuals causing disturbances in west Baltimore. We are deploying resources to keep the community safe. See more photos from the day here. 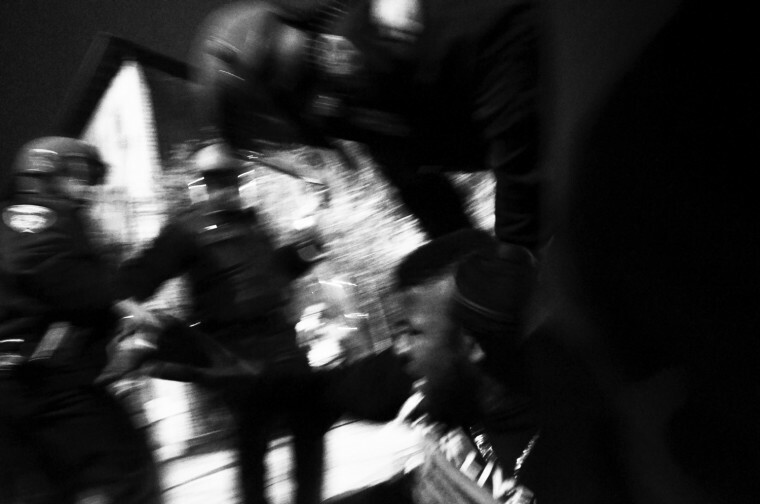 April 26: While on the ground, City Paper photographer J.M. 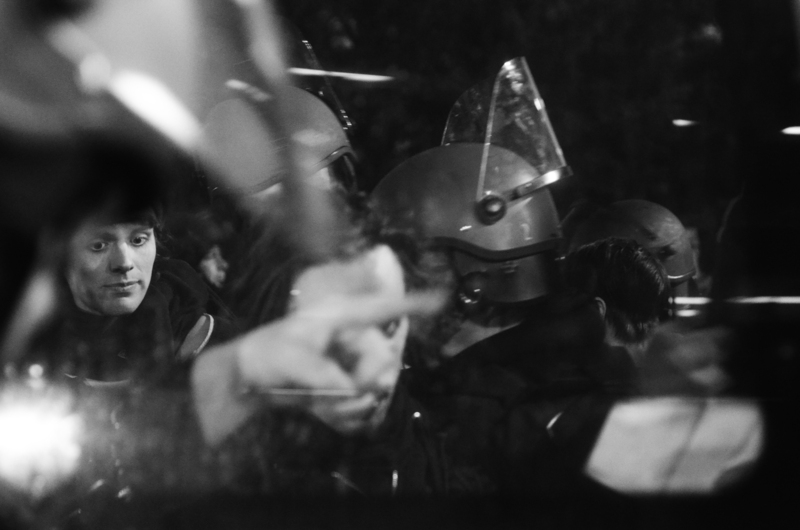 Giordano kept photographing and caught this encounter between police and a protester. See more photos from the day here. 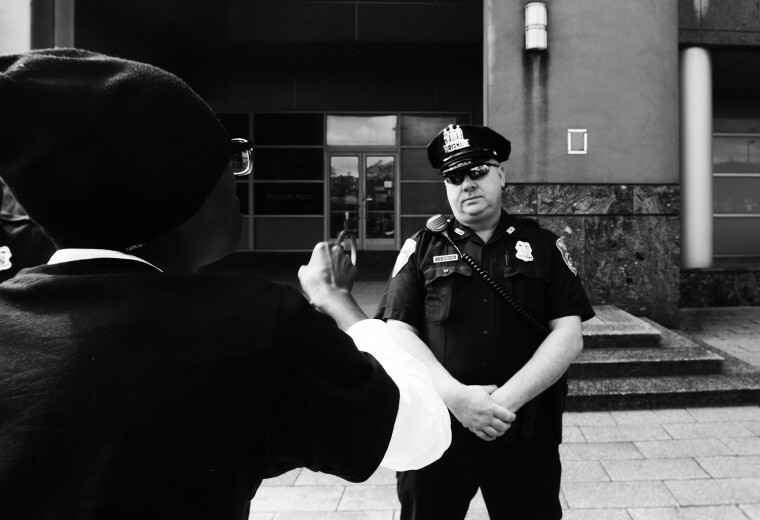 April 27: After a serious altercation with teens at Mondawmin Mall, police try to secure the streets around the mall. Protesters continue to throw bricks, stones, and bottles as police respond with pepper spray and tear gas guns. 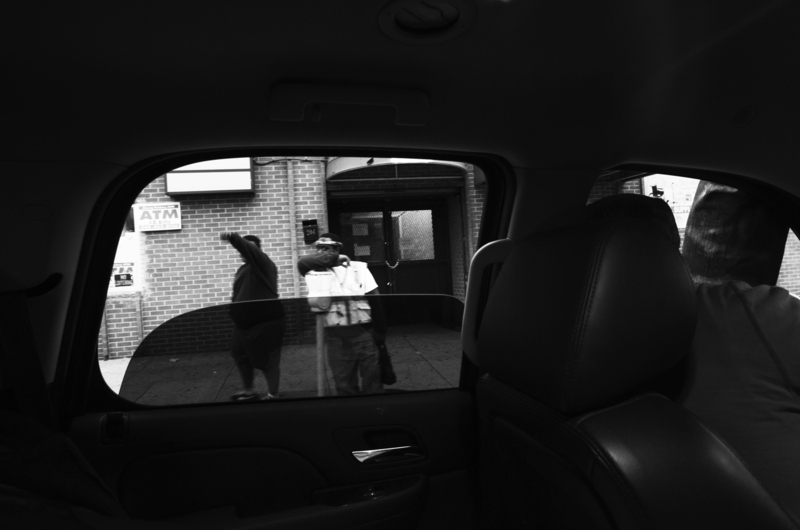 BCPD tweet: There is a group of juveniles in the area of Mondawmin Mall. Expect traffic delays in the area. See more photos from the day here. 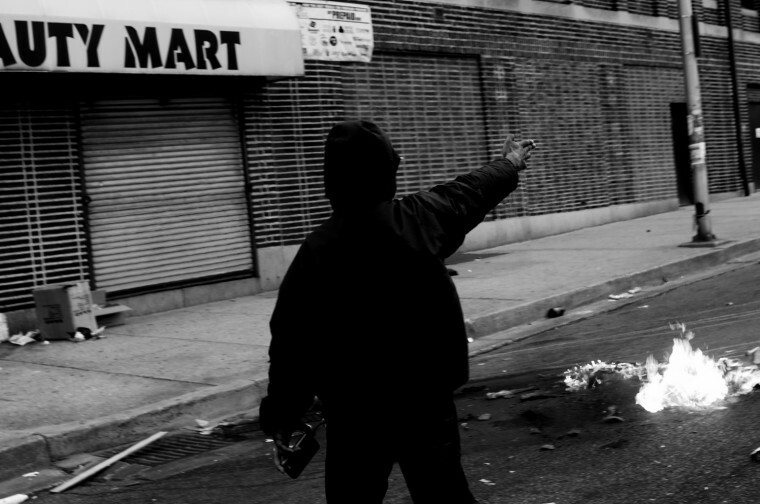 April 26: Looters destroy shops, police cars and a CVS at the corner of North and Pennsylvania avenues. The corner will become Ground Zero for the protests. See more photos from the day here. April 27: A shot taken during the riots, through a shattered police car window. See more photos from the day here. April 27: Looters destroy shops, police cars, and a CVS at the corner of North and Pennsylvania avenues. The corner will become Ground Zero for the protests. BCPD tweet: Several juveniles are part of these aggressive groups. WE ARE ASKING ALL PARENTS TO LOCATE THEIR CHILDREN AND BRING THEM HOME. See more photos from the day here. 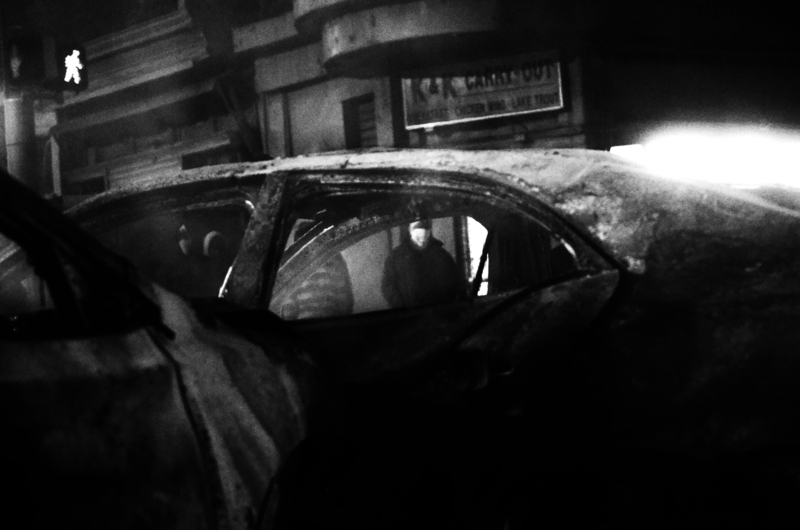 April 28: Rioters watch one of the two cars that were burned at North and Fulton avenues smolder just after midnight. Multiple fires were set throughout the city during the riots. See more photos from the day here. 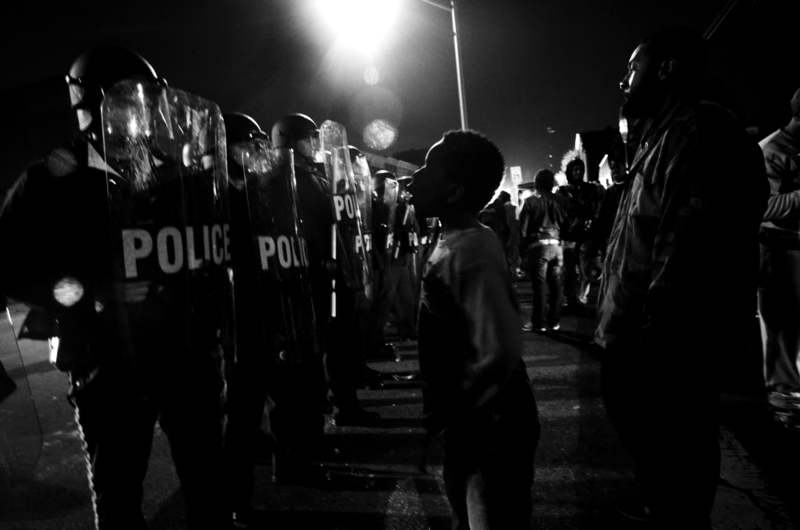 April 29: The first night of curfew is in effect. See more photos from the day here. April 29: The first night of curfew is in effect. 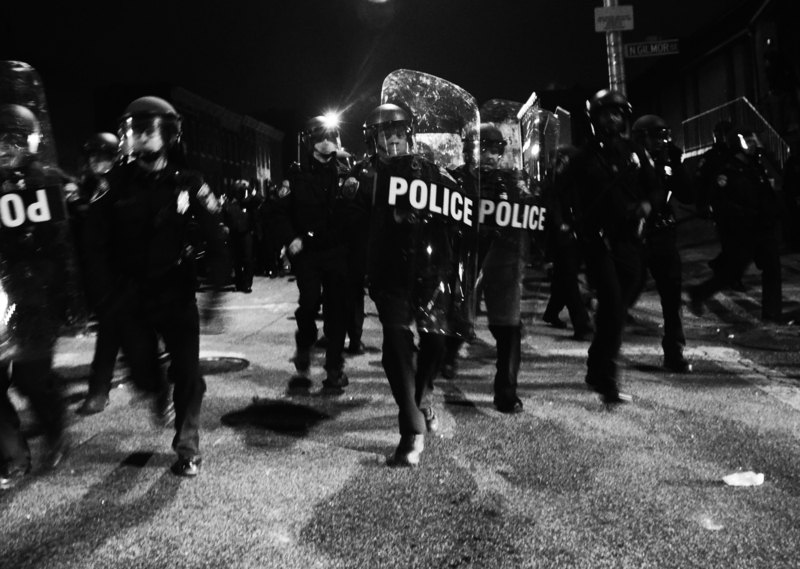 BCPD tweet: Officers are now deploying pepper balls at the aggressive crowd at North Ave / Pennsylvania Ave. See more photos from the day here. 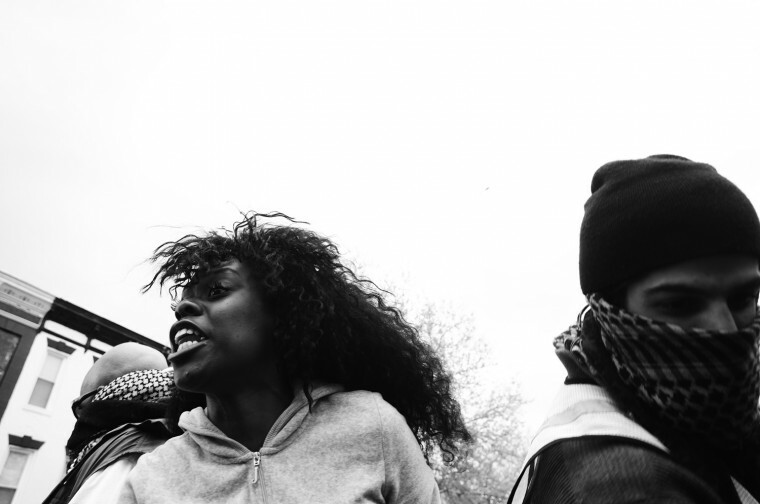 May 1: A massive march from City Hall to the Glimor Homes neighborhood remains peaceful. Residents stop for the procession in front of a burned-out market a block from where Freddie Gray was arrested. May 1: Hundreds ignore police and National Guard barricades at the Western District precinct and continue to march back to City Hall. See more photos from the day here. 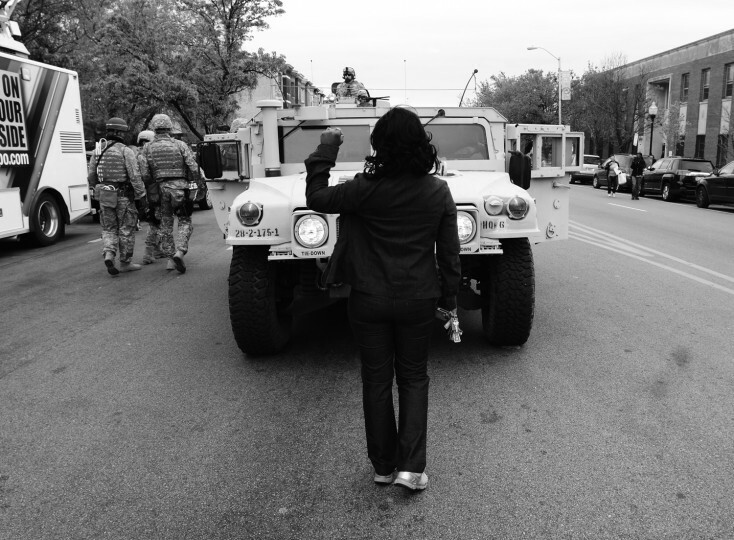 May 1: A massive march from City Hall to the Glimor Homes neighborhood remains peaceful. SUVs are part of the march back to City Hall. See more photos from the day here. 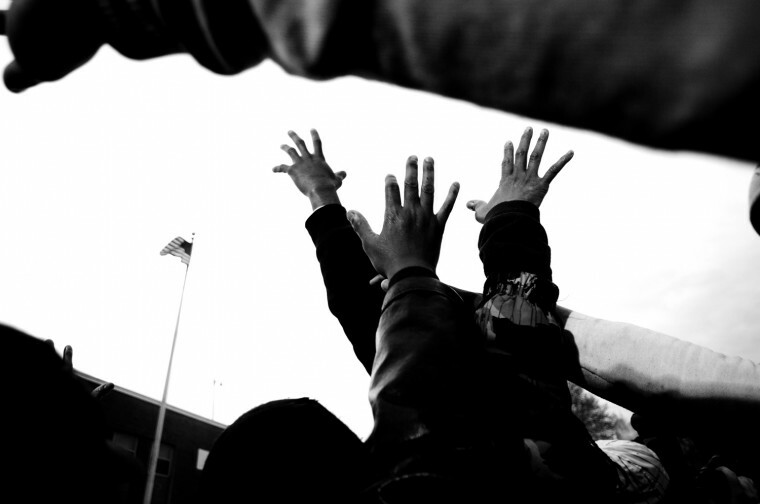 May 1: Despite the peaceful protests, marchers are arrested at City Hall for curfew violations. BCPD tweet: Officers are arresting protesters who refused to leave after the curfew went into effect. See mire photos from the day here. 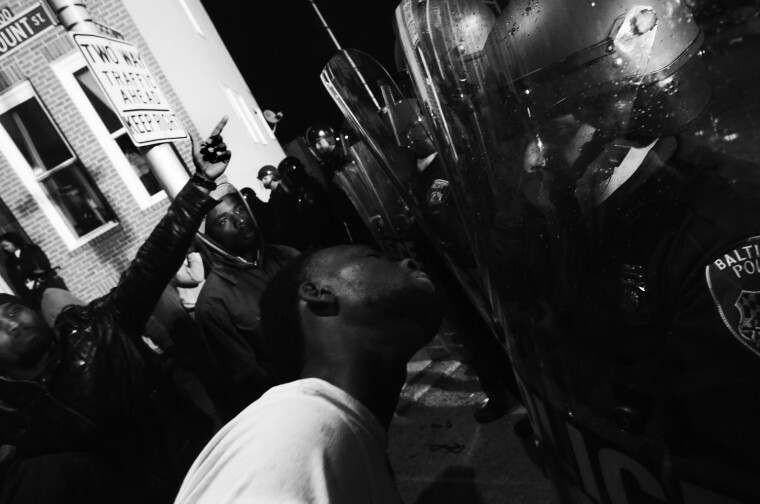 May 1: A protester celebrates the decision to charge six police officers in the death of Freddie Gray. 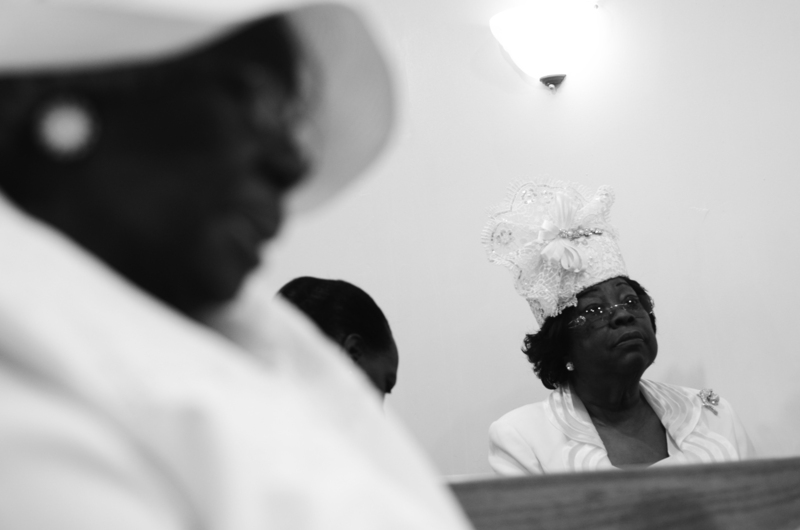 See more photos of the day here. 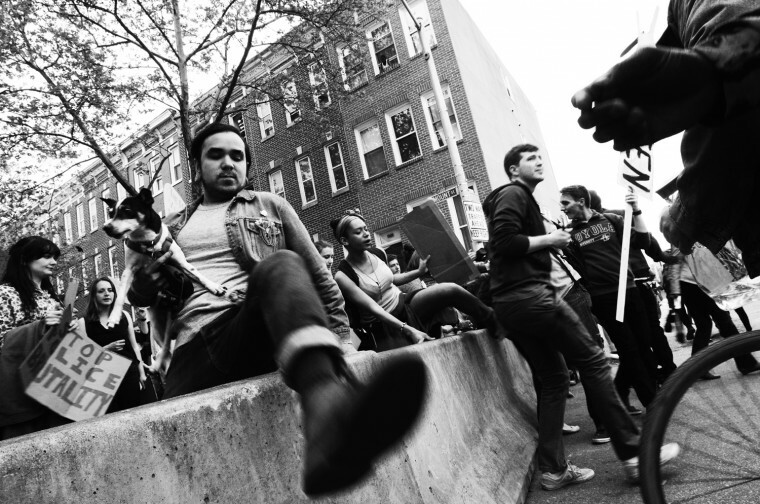 May 2: Protesters gather at North and Pennsylvania avenues after a march from City Hall. BCPD tweet: We are receiving reports that members of the media and citizens are on the roof of the metro station. Please get down for your safety. See more photos from the day here. 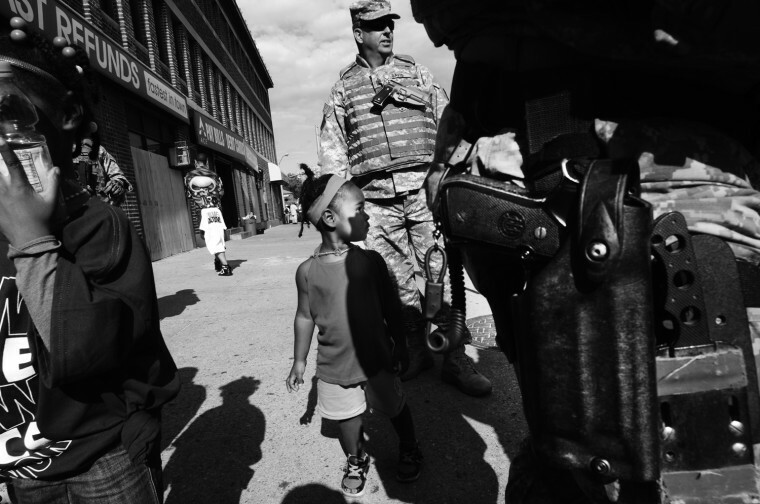 May 2: National Guardsmen mingle with residents after a peaceful protest at City Hall. See more photos from the day here. 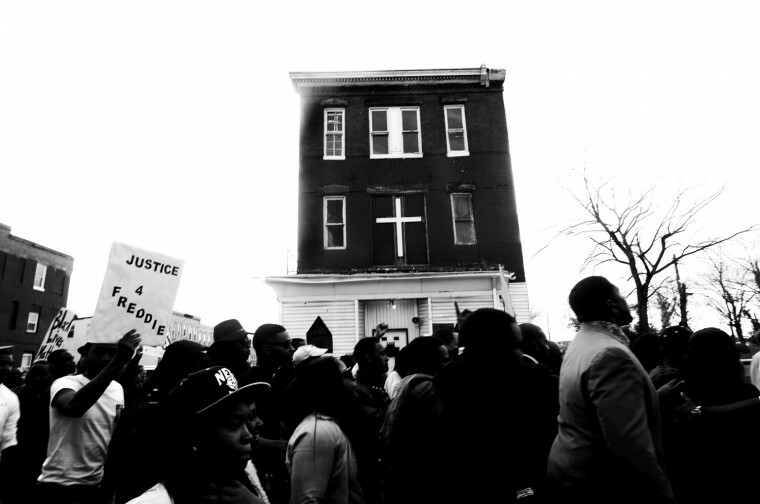 May 3: The curfew is officially lifted and residents of the Gilmor Homes community take to church to celebrate. There are no BCPD tweets about the lifting of the curfew. See more photos from the day here.